PT PLN is a government-owned company that manages the electric power industry in Indonesia. To ensure a stable power supply for North Sulawesi province, PT PLN has built and currently operates four geothermal power plants in Lahendong, which is located 30 km south of Manado, the provincial capital. The two newest plants, Lahendong III and Lahendong IV, each produce 20 MW of electricity, and the financing for their construction was provided by the Japanese government’s Official Development Assistance (ODA) program and the Asia Development Bank (ADB), respectively. Indonesia’s economy is growing at a remarkable rate, and the country’s demand for electricity far outstrips supply. Despite holding 40 percent of the world’s geothermal reserves, enough to produce about 30,000 MW, the country has done relatively little till now to make use of this resource. However, the Indonesian government has signaled a strong intention to begin developing the country’s geothermal resources. Geothermal energy is a clean and renewable power source, and plants of this type produce extremely little CO2, which is a major contributor to the greenhouse effect. For this reason, efforts to make use of this resource are gaining momentum, and its development is expected to bring great environmental and economic benefits. 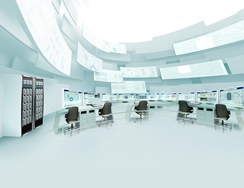 At the Lahendong III geothermal power plant, Yokogawa installed the CENTUM CS 3000 distributed control system (DCS) with redundant controllers, a backup system, and a test system. Based on the success of these installed systems, Yokogawa subsequently received an order to install its CENTUM VP DCS at the Lahendong IV geothermal power plant. Then, when carrying out a project to renovate the 20-MW Lahendong I plant in the ensuing year, PT. PLN selected the CENTUM VP to replace the existing Bailey INFI 90 system that had been used to monitor and control the steam turbine auxiliary facilities as it was approaching the end of its useful life. The solid performance of the systems used, combined with Yokogawa's superior technical expertise in geothermal power generation, the proven quality of its products, and its extensive engineering and service network in Indonesia, were primary considerations in PT. PLN's decision to go with the CENTUM VP solution again. Plant and turbine startup and shutdown procedures are very complex and time-consuming, and place great stress on both personnel and equipment. To eliminate operator errors during these critical processes, the CENTUM DCS has automated plant and turbine startup and shutdown procedures. The startup and shutdown sequences are executed in accordance with the logic design, and the DCS human machine interface (HMI) clearly shows the status of the sequence and the facility conditions. It also guides operators in the acknowledgement of messages and alarms and the triggering of interlock sequences. Operator intervention during the automated plant and turbine startup and shutdown processes is minimized, ensuring safe and smooth startup and shutdown. This greatly reduces operator workload and errors, shortens the startup and shutdown times, and mitigates thermal and physical stress on the turbine. The backup system ensures that the plant can run safely without any interruptions. All events are precisely recorded with millisecond accuracy and displayed in a sequence of events (SOE) window for later analysis. Using this, operators can assess the problem cause and request a fix by maintenance personnel. When application software needs to be modified, the revised software must be tested before it can be downloaded to the controller, requiring a plant shutdown. To maximize plant uptime, Yokogawa provided a test system that uses the test functions of the CENTUM CS 3000. This test system accurately replicates the plant control and graphical interfaces, and the software can be easily checked under the same conditions as with the actual plant system. It can be also used to train the operators. The design and structure of the CENTUM CS 3000 and CENTUM VP systems for these new geothermal power plants exceeded PT PLN’s high expectations. 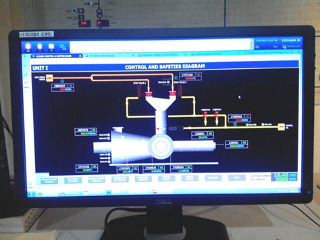 The use of the same HMI in both systems allows for complete consistency in the monitoring and control of the power plants and turbines at both plants. PT PLN greatly appreciates having the ability to automatically execute flawless plant and turbine startups and shutdowns, and PT PLN is looking forward to further such technology collaboration with Yokogawa.